Andrew Bynum grabs one of his 18 rebounds. If Andrew Bynum continues to play defense and rebound the way he has since the All-Star break, the Lakers will be a very difficult team to beat yet again come playoff time. Bynum scored 10 points, grabbed a game-high 18 rebounds, and blocked four shots, as the Lakers overcame a five-point halftime deficit and pushed their way easily past the Orlando Magic 97-84 at Staples Center on Monday night. The Lakers are 10-1 since the All-Star game, and continue to play well against the league’s elite teams. The win on Monday pulled the champs (48-20) virtually even with the Dallas Mavericks (47-19) for second in the Western Conference standings. Both teams are 6.5 games behind the San Antonio Spurs. Kobe Bryant, playing despite a sore right ankle, scored 16 points, but struggled shooting just 7-19 from the field. He only needed to play a little over 30 minutes on this night however. Pau Gasol scored a game-high 23 points, Lamar Odom had 16 points and seven rebounds off the bench, and Derek Fisher chipped in 15 points. The Lakers had five players score in double figures. The Magic were able to stay ahead early thanks to some hot shooting from the three-point line, and the Lakers’ inability to put the ball in the basket. In fact, the Lakers shot just 27% in the first quarter, but trailed only by six (25-19) thanks to the second efforts on the boards by Bynum, who had nine offensive rebounds for the game. The Lakers trailed 46-41 at the half, but took over defensively in the second half. The game was still close after three quarters with Los Angeles nursing a 71-66 lead, until the Lakers’ reserves put together an 18-5 run against the Orlando starters to push the game to 85-69 with just over seven minutes left. The Magic were never able to get closer than 11 points the rest of the way as the two-time defending champs cruised to the victory. Dwight Howard had 22 points and 15 rebounds, but did most of his damage with the game out of reach, and Bynum on the bench. He also turned the ball over a horrific nine times. He was also nowhere near as dominant as the first time the two teams met in Orlando, and was rejected near the rim twice by Bynum, a sign that this would be no easy night for the All-Star. Jameer Nelson and Ryan Anderson each scored 13 points, and Hedo Turkoglu added 12. Orlando got just 13 points from their bench, including an 0-6 performance from the field from Gilbert Arenas, who continues to have a disastrous season since being traded from Washington earlier this year. For the game, the Magic did out shoot the Lakers from the field, 47.1% to 43.8%, but the Lakers’ shooting woes were mostly in the first half. They shot over 50% in the second half. 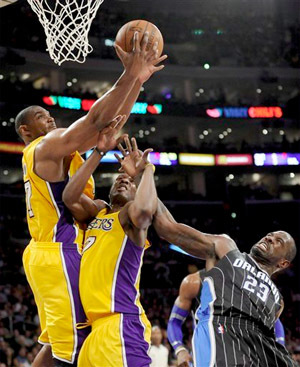 Los Angeles outrebounded Orlando 41-39, including 14-6 at the offensive end. The Magic as a team turned the ball over 18 times to the Lakers’ five giveaways. Orlando did make 10-23 (43.5%) from beyond the arc, but struggled after a hot start. Monday’s win was the first of seven straight home games for the Lakers, as they continue their strong push towards the playoffs. They now get four days off until they host Minnesota on Friday night. 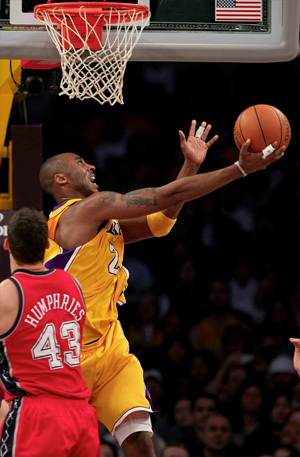 Kobe Bryant makes circus shot against Nets. The New Jersey Nets, one of the league’s doormats, certainly has not made life easy for the defending NBA champs in two games this season. The Lakers had their hands full again on Friday night, but led by Kobe Bryant, were able to get a 100-88 win over the Nets at Staples Center. Bryant scored a team-high 27 points, to go along with four assists and four rebounds, as the Lakers beat the Nets for the seventh straight time. But it wasn’t easy. 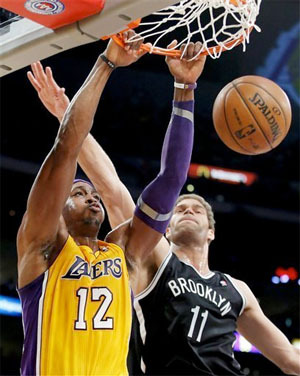 The Nets led after one quarter 24-22, as Brook Lopez shredded the Lakers down low all game long. The Lakers recpatured the lead 45-40 by halftime, but never were able to shake New Jersey completely in the second half. During the second 24 minutes, the Lakers had the lead up to double-digits on a few occasions, but the Nets simply would not go away, led by the play of Lopez and former Lakers Jordan Farmar and Sasha Vujacic. And with all the Carmelo Anthony trade rumors surrounding team, their focused effort was even more impressive. The Lakers made enough good plays in the fourth quarter and kept the visitors at arm’s length to get the win. It was Los Angeles’ seventh straight victory, their longest since opening the season with eight consecutive wins. Pau Gasol scored 20 points and grabbed nine rebounds in under 33 minutes. He also blocked four shots. Lamar Odom had 14 points and a 11 rebounds off the bench, and Ron Artest played a solid game, scoring 14 points on 5-7 shooting from the field. Andrew Bynum was in foul trouble all game long, and managed just two points and five rebounds in 22 minutes. The Lakers shot 49.3% (35-71) from the field, hit 25-35 free throws, and committed only nine turnovers. Their downfall was on the glass, as the Nets held the rebound edge 45-38, including 15-7 at the offensive end. The second chances allowed New Jersey to take 14 more shots from the field, which kept them in the game, despite shooting just 42.4% (36-85) from the floor. Lopez had a huge game, with 35 points on 13-19 from the floor. He was just two off his career-high of 37 points. He also added six rebounds and four assists. Farmar and Vujacic got warm ovations from Lakers’ fans in their first games back at Staples Center. Vujacic was second on the team in scoring, tallying 17 points on 7-16 from the field off the bench. Farmar also had a nice game with 12 points, also coming off the bench. They were the only two players in double-figures besides Lopez. The Lakers next game is Sunday at Staples Center against the Clippers. The Clippers will be the designated home team for the game, and are playing much better ball as of late, including a shocking 111-105 win over the Miami Heat on Wednesday. The Lakers beat the Clippers 87-86 back on December 8th, on a running layup by Derek Fisher at the buzzer.